1. Peel and quarter the potatoes. Peel carrots and cut into 2-inch chunks (or use our Baby Carrots!). Peel onion and cut into wedges. 2. Place potatoes, carrots, and onions in slow cooker. 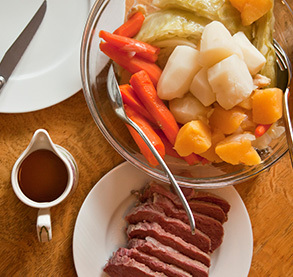 Lay corned beef on top of vegetables and sprinkle with cloves, peppercorns and brown sugar. Cut meat in half, if needed, and stack the pieces on top of the other. 3. Add the ale and enough water to just cover the brisket. Cover and cook on low for 9 – 11 hours. 4. Remove the corned beef and place in serving casserole. Arrange the vegetables around the beef, cover to keep warm. 5. Cut cabbage into wedges, leaving its core attached, to hold its shape. 6. Put cabbage into cooker with the cooking liquid and turn to high. Cover and cook until crisp-tender, 20 minutes. 7. Serve the beef, sliced across the grain, with vegetables and cabbage. Pass the juices from the crock in a bowl. Serve with mustard, if using.